Photo credit: Stuck in Customs This is the Voskhod Building in Pripyat. 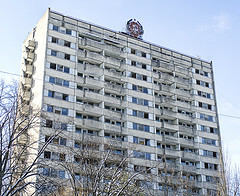 It's one of two identical apartment blocks, designed to house the superior engineers of Chernoybl. As such, it was visibly luxurious inside, especially considering standards at the time. I climbed to the top, took photos from every angle, and William Hall of Life in Megapixels very kindly stitched them together for me, and corrected some errors. The resulting stitch shows probably the most complete picture of Pripyat Town that you can get in a single place - if you look closely, you can even see the "Steel Yard" (Duga-3 array), and you can make out all the famous major buildings, including the fairground. This was shot on 29th May, 2011. Close this dialog, then use your mouse to look around. You can scroll-zoom for a little extra detail. Note: you can find some discussion about this panorama on Reddit.